The famous ‘Rosie Phua’ from Phua Chu Kang Pte Ltd TV series thrilled the Diploma in Entertainment Arts students at KDU University College with her visit. Irene Ang did not have a normal childhood being born to a mother who is a drug addict and a father involved in gangsterism. We needed no introduction to “Rosie Phua” or Irene Ang, famous as the wife of Phua Chu Kang in the Singaporean Phua Chu Kang TV sitcom. Coming from a troubled childhood and raised by her grandmother, Irene shared that her “wake up call” came when her grandmother passed away. She regretted being a “difficult” granddaughter who still owed a debt of S$500 (RM1,257) to her late grandmother. Ang decided that since she could not repay her grandmother, she would do so to society instead. “Sometimes when you get to the edge, you have to jump,” said Ang as she explained the start of her career. She started the highly successful Fly Entertainment and is the CEO. This is a testimony of her success having come from humble beginnings. 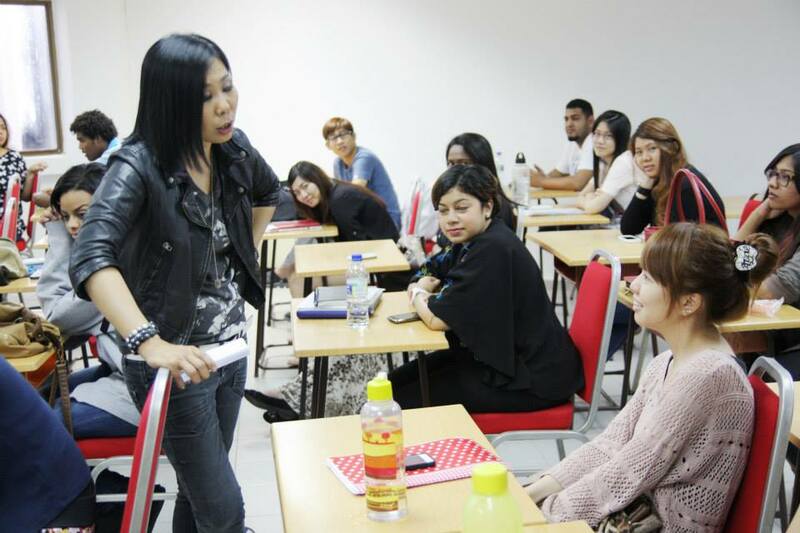 KDU University College during their “Introduction to the Business of Artiste Management” class. Coming from a difficult family background, Irene certainly had to struggle to get where she is standing now and she is more than eager to share whatever knowledge that she possess on the industry. Even after being a prominent name in the industry, she still keeps a humble and very likeable profile. “I started as a ‘wubbie’, which is a person that warms the audience up during live filming, and I signal for the right expressions. “I learnt how to work a crowd from there. How to get a crowd laughing or how to distract them,” Ang said as she made gestures with a range of facial expressions. Irene got her big break when she was spotted doing her job as a “wubbie” and asked her to audition for the colourful character, Rosie Phua. Irene Ang aka Rosie Phua sharing a light moment with John Lai Wai Hong. She however managed to impress the casting director without a script and the famous character “Rosie Phua” was born. In 2002, Irene achieve recognition for her efforts when she won an award Ang for “Best Comedy performance by an actress”. In addition to her acting career, Ang is also the CEO of Singapore’s first and largest artiste management agency that she founded in 1999. “Located behind a factory, it started with only two staff and a fax machine that would always get jammed,” Ang said as she demonstrated how documents would get stuck. Due to her consistent efforts, she earned a nomination in 2004 as “Ernst & Young Entrepreneur of the Year” and then in 2008 with a place amongst The Executive Magazine’s “Top 25 Most Powerful Businesswomen”. Ang also had some advice for the attentive audience. “Don’t do things to win awards; do it for the sake of what you enjoy. “Always respect everyone you meet and the recognition will follow,” she said. Ang is not immune to criticism as she shared her experience with one particular critic. “Because of this article that said ‘Irene Ang is so not funny’, I felt so hurt,” she said with a dramatic pout. “Yet I kept that article as a reminder to become better at what I do. “Rejection is a reason for reflection,” she added. The humble actress is now a highly successful businesswoman in the entertainment industry also shared her tips on artiste management. “Managing talents is about being their confidante…” she said as she displayed a portfolio of celebrity artistes under Fly Entertainment. Ang said the highest grossing artiste is not necessarily the best looking but those who are multi-talented. “Looks fade but you can’t take away talent,” she said, reminding those who might venture into the market. Richard Chua Lian Choon said events such as these with Ang are meant to provide positive engagements between their students and successful industry professionals. Ang’s advice to would-be artistes, is to be a craftsman. “Aim to compete with yourself instead and never be afraid to make mistakes,” she added. The Diploma in Entertainment Arts is the only one in Malaysia offered at KDU University College. The aim of the programme is to produce all-rounded creative talents who can take on a variety of roles such as acting, singing, dancing, hosting and modelling, as well as manage their own careers with a good grasp of the entertainment scene. Students will learn how to market, brand and position themselves in this competitive industry. The syllabus is carefully crafted to allow progression into undergraduate studies in performing arts as well as communication and media studies. KDU University College is a subsidiary of Paramount Corporation Berhad Group, a public listed company with a strong property arm consisting of Property Development, Property Investment and Property Construction. Established in 1983, and a pioneer in Malaysian private education, KDU prides itself with its impressive alumni of more than 46,000 graduates. Many have successfully transferred to universities around the world to further their studies and have emerged as top students from these universities to become competent graduates who excel in their workplace. game technology, platinum status ACCA and business degrees from the Top 50 UK university, Keele University. KDU University College is also one of the top Pre-University providers in Malaysia having produced many top award winners in the Cambridge A-Levels. KDU is the only university offering the prestigious University of New South Wales (UNSW) Foundation Year in Malaysia with access to Australia’s Group of Eight universities and other top universities in Australia and New Zealand. Their AUSMAT graduates have obtained scholarships from top universities around the world. Established since 2009, EduSpiral Consultant Services helps provide information and counselling on courses and universities in Malaysia. EduSpiral Consultant Services also represents Northampton University, UK, MDIS Singapore and Hong Kong Polytechnic University.